Occasionally, a student asks a question so basic, about a presumption so fundamental to the teaching of history, that an instructor is caught completely unaware. A friend of mine found this out in his US history survey—in teaching about the colonization of the Americas, he made the commonplace assertion that indigenous peoples were highly susceptible to diseases brought from the Old World. Of course, we all know that smallpox, measles, and yellow fever ravaged the New World—at times literally decimating local populations—while the Americas only really sent back syphilis and lung cancer in return. But why, one student asked, were Native Americans so highly vulnerable to diseases from Europe and Africa, and not the other way around? Shouldn’t the European colonizers have been exposed to diseases in the New World that they did not have antibodies for, just like the indigenous peoples of the Americas were unprepared for the epidemiological onslaught of colonization? It turns out there are, in fact, simple explanations. As Alfred Crosby revealed in his seminal Ecological Imperialism (1986), diseases tended to circulate in crowded, urban areas, especially where domesticated animals were present and poor sanitation provided an auspicious environment for pathogens to proliferate. Cultures in Europe, Asia, and Africa had many such settlements, while the Americas had fewer large urban environments and almost no domesticated animals. Hence, indigenous people had not been exposed to such diseases to the same extent and had not built up a resistance to them. The compromise has often been taught as a bit of a Faustian bargain between the Northern and Southern states: a necessary concession worked out as Americans tried to replace the faulty Articles of Confederation in the 1780s. To get the Southerners on board, the founders had to be willing to diminish the humanity of slaves by not counting them fully for the purposes of taxation, but still counting them (somewhat) for the purposes of giving the South representation—and political power—in the new Constitutional order that replaced the Articles. Southerners got the benefit of partial representation for people who were property, who could not vote and essentially had no rights, while not necessarily getting taxed on all their population (or property). But it occurred to me the other day—what taxation? It seemed like such a ludicrously simple question that it felt like I must have missed or forgotten something from all my reading in grad school. Sure, it made sense that the Southern states wanted to have slaves count as much as possible in terms of allocating House seats and presidential electoral votes, and the Northern states thought that slaves should not count at all—three-fifths was one way of splitting the baby, so to speak. But if slaves were counted at this ratio for representation, how were they counted in terms of taxation? In other words, what taxes were ever levied on the basis of the three-fifths compromise? It seems like a simple question, and I’d taken for granted in my teaching for years that this compromise was for both representation and taxation without thinking about what that actually meant. In fact, American historians know that few “direct taxes” were imposed by the federal government prior to the Civil War. During the antebellum era, the feds depended mostly on excise taxes (on goods such as liquor) and customs duties (on goods coming into the country). As Richard Bensel argued in his book Yankee Leviathan, the United States only consolidated a truly national government during the crisis of the Civil War. Prior to the conflict, the federal government had a rather weak hold over the states and exercised few powers of taxation and regulation. My research is admittedly cursory, but I’ve been hard pressed to find examples of Washington actually levying a direct tax on the states on the basis of the three-fifths formula. One of the few cases occurred in 1798, when John Adams’s Federalist government tried to raise funds for an anticipated war with France. 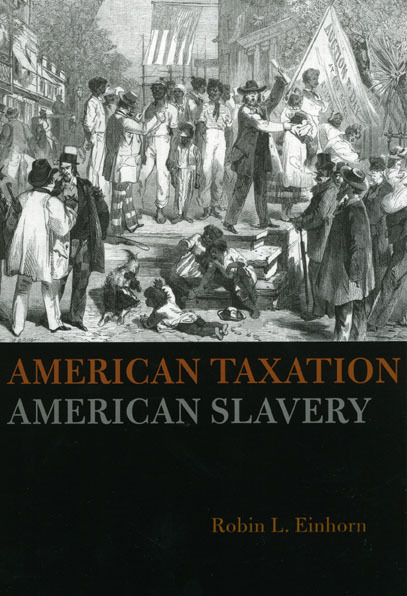 As Berkeley historian Robin Einhorn shows in her book American Taxation, American Slavery, the Federalists had to thread a tricky needle in figuring out how to assess new taxes on the states. Jefferson’s Republican allies sought to lay a “trap” for the Federalists: if the national government tried to introduce a tax on land, and states had to pay in accordance to the three-fifths rule, then common farmers in the Northern states would end up feeling more of the bite, while Southern yeomen would be shielded by the fact that the presence of slaves in their state would reduce their overall tax burden. As Einhorn points out, crafty Republicans such as Albert Gallatin promoted this tax as a way to drive a wedge politically between the ordinary folk and the Federalist-leaning mercantile elite in states like Massachusetts and Pennsylvania (which had just experienced an anti-tax revolt in the form of the Whiskey Rebellion). Southern slaveholders also liked the idea, since it seemed to show them protecting the interests of their poorer white neighbors—a critical factor in maintaining a unified front among whites, rich and poor, in favor of slavery. Federalists thought they had gotten the better of their Republican opponents in devising a carefully constructed tax law, but as Einhorn points out, American citizens were not particularly concerned about the intricacies of the system. “The fact that they [the Federalists] imposed a direct tax would be more obvious than the details of its design,” she astutely observes (195). The new taxes led to considerable consternation and were repealed when Jefferson came to power in 1800. Indeed, in the grand scheme of things, these taxes seem trivial compared to the federal government’s far greater reliance on the tariff in the antebellum era. In short, it looks like the taxation element of the three-fifths compromise is the proverbial mouse that roared. If it was a compromise in the sense that Southerners lost something—two-fifths of representation that they could have had politically—in order to get something—a two-fifths discount on the potential taxes they would have to pay—then it doesn’t seem like much of a compromise at all. 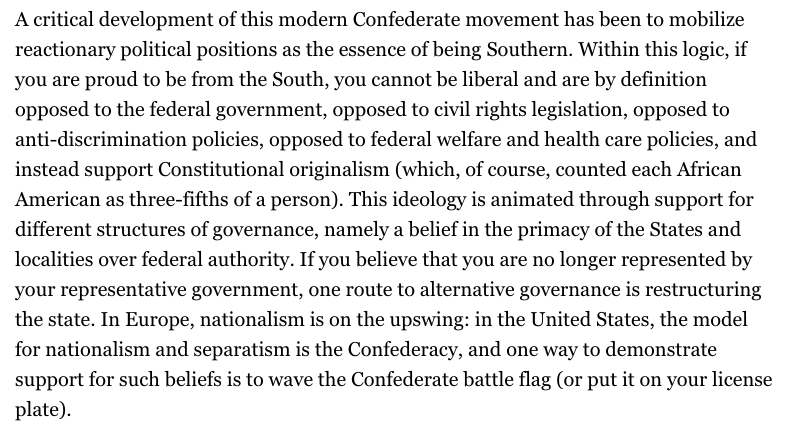 But such a framing fundamentally misreads the historical context in which the compromise emerged. What eventually made its way into the Constitution started as a debate about how to reform the Articles of Confederation. The typical high school student learns that the US government under the Articles was a dysfunctional mess—a group of quasi-independent states held together with bubblegum and scotch tape, with no executive and a unicameral Congress that found it difficult to compel its member states to cooperate in funding the national government. In the 1780s, Congress not only had to get the states to pay their way in funding the fledgling American state—they also had to get Massachusetts, Virginia, Maryland and company to chip in to pay the war debt from the Revolution. The various states tussled over how to do so, and the demand for maximum consensus under the Articles made it virtually impossible to reconcile the interests of Northern versus Southern states, wealthy versus poor, (relatively) urbanized versus rural. North Carolina, notably, favored a property tax, since its property was worth virtually nothing. As the Tar Heel state’s delegates put it: “Other states must pay for their large Towns & lands highly cultivated, while we have few towns and much wood land” (140). In short, as Robin Einhorn shows, the three-fifths compromise emerged out of a fraught debate among the states about how to assess the obligations of each to the national government. Northern states with small or no slave populations were indignant that Southerners didn’t think their slaves should count as property. “The Negroes are wealth,” after all, and if Northerners were to be assessed on their land and other property, then slaves should count too. Amazingly, Southerners insisted that slaves were not an asset but an “incumbrance to Society,” as North Carolina’s Hugh Williamson put it. Slaves were not as productive as free workers in the North or the South, since they had “no interest in their labor,” “did as little as possible” and “omitted every exertion of thought requisite to facilitate & expedite it” (143). Slaveholders even argued, implausibly, that they didn’t force the children of slaves to work as early as the progeny of free families. Hence, slaves were more a debit than a credit on the account of the Southern economy and should not be counted fully, if at all, for the purposes of taxation. Reconciling these axiomatically opposite positions about the nature of slavery, of course, was difficult, and the three-fifths compromise was the best that the framers of the Constitution could ultimately achieve. Einhorn argues that slavery was the elephant in the room in terms of the history of American taxation from the very beginning. How to fit people-as-property into a workable system of taxes was always fraught with contradictions, and anxiety over how slaves would be counted continually vexed debates about taxation in the early Republic. Meanwhile, northern states were able to figure out more efficient and reasonable tax regimes on the basis of free labor, while Southerners perpetually dodged and resisted the power of the state to tax because slaves occupied such a “peculiar” place as both persons and property—leading, perhaps, to the South’s continued allergy toward taxes and progressive taxation in particular. In the end, the American approach to taxation was inevitably warped in numerous ways by the compromises necessary to “square the circle” of slaveholders’ interests versus everyone else. The three-fifths compromise was just the first of these—even if, in the end, it may not have resulted in very little actually being taxed on a three-fifths basis. Americans in the days of the Articles of Confederation argued over how each state should “chip in” to the national government, and the compromise reflected concerns about how such obligations would be calculated in the future. 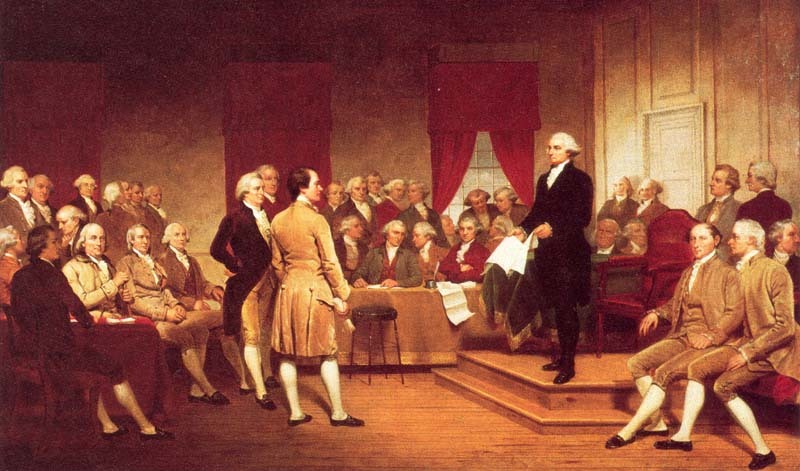 Yet once the Constitution was established and a new regime took power under George Washington, the federal government relied on import duties and excise taxes to fund itself; it did not necessarily call on the states to provide direct fiscal support through a formula based on population. What Americans got, though, is a system of taxation and representation that still bears the impact of the weird compromises that were necessary to accommodate people who owned people. If the tax burden rarely fell on the basis of three-fifths, political power certainly did. The South was able to pad its margin in the House and the Electoral College throughout the first half of the nineteenth century, making possible the many odious compromises and workarounds that sustained slavery. As Einhorn notes, even as the population of the free North swelled due to immigration, Southerners could play the game of balancing power in the Senate through the selective admission of new free and slave states—until the game was up in 1860. In a final irony, it turns out that the three-fifths compromise actually constrained the full political force of the South in a sense. Prior to the Civil War, the provision meant that Southern states did not get the benefit of counting their entire populations for political representation; afterward, they got 100% representation with the abolition of slavery. As the South gradually disenfranchised black men in the late nineteenth century, their numbers counted for purposes of representation, but not for voting—meaning that the political power of white conservatives was more potent and concentrated than it had ever been before. The three-fifths compromise was, in the end, just one of many jury-rigged features of American democracy that were meant to constrain it. It was designed to tie the hands of majorities and preemptively constrain the taxing power of the state—a legacy of both the anti-tax spirit of the Revolution and the anti-equality conviction of slaveholders. If its implications for allocating taxes have been far less important than the founders imagined or feared, its impact in terms of amplifying the voice of Southern reactionaries and their descendants has been far more significant. It also reveals one root (among many) of a long-standing American aversion to reckoning with how to tax property and income fairly, since, from the very beginning, a democracy had to account for human beings as both people and property.